No finished project post yet. I still have been unable to take a picture, but I will as soon as I can. Today is my birthday. I’m 32 now. That sounds so weird. The Swap Your Stash was fairly successful for me! I didn’t get rid of everything, but I did have requests for about a third of what I’d posted. And most of those were things that I had either already made things out of and was therefore stuck, or things I couldn’t use at all (like accidentally pink silk!) I’ve sent out 4 pieces to 3 people, am waiting on addresses for 2 more, and so far I’ve received one package, from Anne in the UK. I’m not sure how this will end up as far as yardage in vs. out goes, but I tried to be very thoughtful in the things I swapped for, so hopefully I will end up with things that are much more useful for me! My future sewing room is coming together very nicely. Doug and I spent last Friday night moving my sewing machine table to his place–I haven’t been using it lately, because I get way too cold in the basement this time of year and have therefore been doing all of my sewing upstairs, like I tend to do every winter. We also did some organizing in there. Most of my scrapbook/jewelry related things are there now, as well as a little fabric and probably about half of my yarn. We’ve also been discussing fabric storage options, and stumbled across a good option on sale at Target. 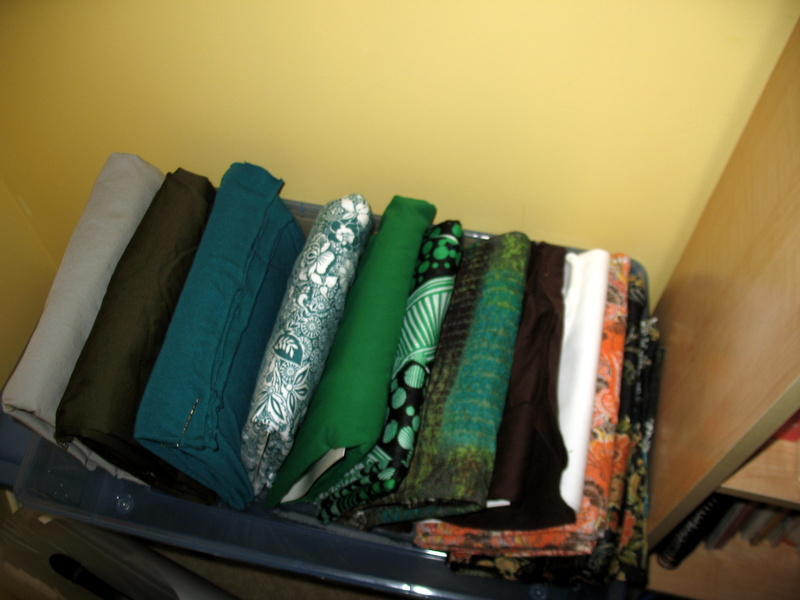 So we’re probably going to spend this Friday evening moving the bulk of my remaining fabric stash and organizing that. Assuming I get done the dress in enough time to actually sew something else before the wedding, I figure I can just stop by his place and grab the fabric that I want. Speaking of the dress, I’m now working on the hemming stage! 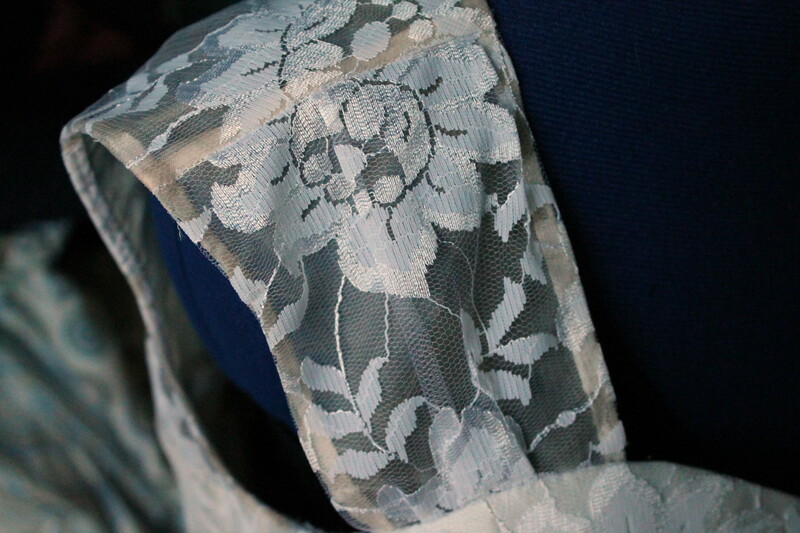 I also spent some time over the weekend cutting out lace appliques for the skirt. I think that’s everything for now…back to work. I’m keeping this one fairly short today– just wanted to show some details of the back that I’ve been working on over the last few days, as told on Twitter. Yes, that’s right, I made my own hashtag. And yes, I also realized as soon as I’d posted it the first time that it looks like my dress is ruling the mall. Oh well. Anyway, my mom gets the credit for finding these fabulous rhinestone buttons, because I was having a really hard time finding ones that weren’t pearls. No offense to those of you that like that, but pearls just really aren’t my thing. I actually had to do the wider side of it twice–the first time, I got it a little too close to the zipper and it was showing all over the place. It still shows a bit at the very top, but I’ve also discovered that if I unzip it about a quarter inch or so, the overlay hides it rather well. So I think I’m going to do that with a hook and eye at the top of the dupioni section. And here’s a view of the back! It doesn’t quite button at the top when Donna’s wearing it (I have a thread loop there), and the zipper shows much more on her. I spent at least a good half-hour on Friday walking around in it and standing on a chair so my mom could pin up the outer hem, and it fits me much better. I didn’t actually do any sewing on Friday, since we were also messing around with centerpiece ideas, but I did spend a couple of hours cutting out sunflowers from the lace to sew on the skirt. 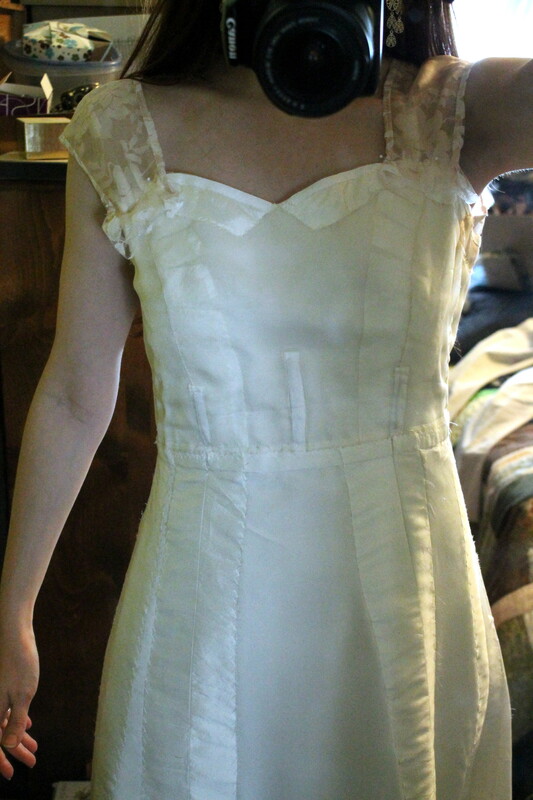 So, minus that, the hook and eye, and the hem, the outside of the dress is done! I still need to cut out and sew/install the lining, but I’m waiting until the hem is done, since I’m not sure if I’ll need to add some tulle layers for fullness and I need to see how the hem will fall first. How long have you been sewing and stashing? How big is your stash? I started learning to sew when I was about 7 years old. Thankfully, I have no stash that dates back to that time, but given that I’m in my early 30s now *cough*, I’ve been stashing for awhile. As for the size, it’s still hovering somewhere at 200+ yards of fabric! Where do you keep your stash? How do you store it? My stash is so big that it’s in two different towns, haha! Just kidding–the real story is that even though I’m not moving in with my fiance until after the wedding, I am in the process of moving what I can down to his place now. So getting my future sewing/craft room set up was a logical place to start, since I do have this somewhat all-consuming dress project going on right now. So I’m in the process of moving things from the wall of shame (which refuses to post vertically for some reason–I guess it’s appropriate, since it’s rather precarious of a setup to begin with), where they are folded into plastic bins, or unceremoniously stuffed in wherever they will fit…. ….to the new space. I haven’t gotten a lot of fabric moved down there yet, it’s been more scrapbooking/jewelry stuff/yarn so far, but I did at least get this one bin down. The plan for the new space is to fold the pieces around these letter-paper-sized comic book boards, so they’re all nice and neat like this, and put them on shelving, kind of like this. (Second shelf down.) Except not in the closet, because the mostly wire shelves that Doug so kindly put up for me wouldn’t hold it all. I’m thinking of getting something more along the lines of an Ikea Expedit. What is the oldest piece in your stash? What was your original plan for this piece and why hasn’t it happened? Chronologically, the oldest things I have are a brown twill-type fabric and a tan stretchy also possibly twill-type fabric. Both of these were given to me for free by my mother, who in turn was given these for free by someone connected to someone at my church who was destashing. (She randomly gets given fabric sometimes by people who don’t understand that not all fabrics are good for quilts, and I often get to paw through those leftovers.) I have no idea how old they actually are, and I obviously had no original plan for them but I’m thinking they will get turned into wearable muslins for the Thurlow and Clover pants patterns, respectively. Also, I didn’t take pictures of them because they’re just solid colors and therefore not very interesting to look at. The oldest things I bought myself are these two printed polyesters, both of which date back to my college years. I honestly can’t remember if I even had a plan for the floral, I think I just liked it. I was thinking more of a 60s-style tunic top for the paisley, but I didn’t have a ton of time to sew when I was still in school, and somewhere along the line, I realized that boxy 60s tunic tops are really not flattering on me at all. So neither of them have gotten used yet. I did have a thought of making the floral into a Burda pattern, but I’m thinking now that I might be better off using this one for some kind of summer PJs, since this really doesn’t go with anything else I own. What’s your favourite piece in your stash? Where did you get it, what do you love about it, what do you think you might do with it? I have this lightweight floral knit print that my mom gave me for Christmas a few years ago. I love the colors and the kind of old-world European look of it. And I keep going back and forth as to what to do with it–sometimes I think it wants to be a knit dress, sometimes I think I should make it into a top because I do wear separates more, but then I’ll probably have a bunch left over, and therefore it hasn’t gotten cut into yet. Does the fabric you buy go straight into hiding or do you wash it first? I definitely wash it first. Ironing is another story. I’ve gotten better over the last several years about buying purposefully, and the majority of the fabric I’ve bought over the last year in particular were for specific projects that I had nothing on hand that would work otherwise–fabrics for curtains, waterproof fabric for a raincoat, and of course, the 20+ yards I had to buy for all the various layers of the wedding dress I’m currently sewing! Sometimes I’m given things, particularly by my mom, who likes to give me fabric for Christmas. (We have similar taste in prints, so this is not a problem.) Aside from that, it’s generally fabric lust, because I am most definitely a printoholic, and have to force myself to buy solids that actually work with those fabrics. I have this suedecloth, which is from the same Christmas gift stash as the knit I mentioned earlier. I think this print is so fun, even though the colors are way more neutral than I usually go for–and I have absolutely no idea what it wants to be yet. So I don’t want to waste it, you know? I’m actually not much of a notions buyer–most of my excess buttons and such have come from intended planned projects that never happened for one reason or another, or were salvaged from old clothes that I was getting rid of. And I’ve seriously cut back on pattern buying. Most of the patterns I buy now are from independent designers, and those are way more expensive than the $.99 sales at Joanns, so that curbs my acquisition a lot! (Plus I did a pretty major pattern clean-out a year or so ago.) What I do tend to also stash is non-sewing things, like yarn–it’s hard for me to resist colorful yarns that are wool-free, since that’s all I can use–or patterned scrapbook paper. Yes, I’m still a printoholic there too. 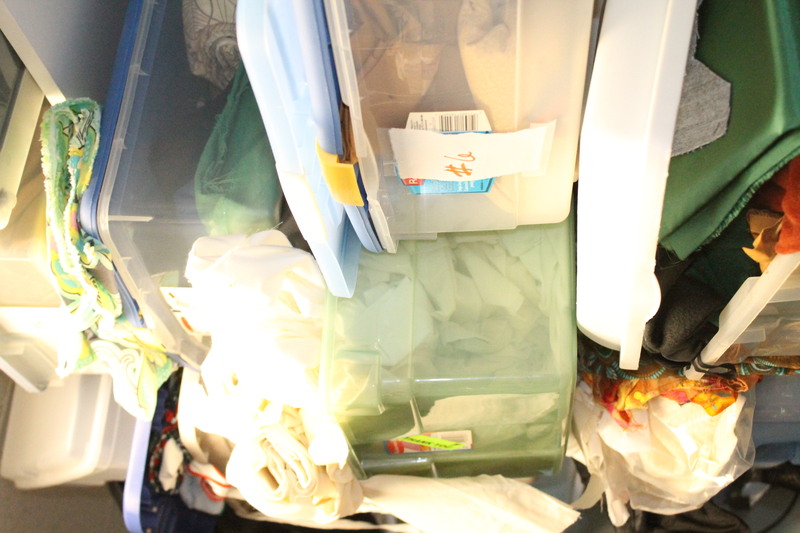 I also have a large bin of clothes that need mending or refashioning, since I just haven’t had time to get to it. I am guilty of thrifting clothes solely because I like the fabric and want to make something else with it, though I’ve managed to keep myself from doing that for the last several Goodwill runs. As regular readers of this blog know, I’ve been trying to do stash-busting resolutions for at least the last 3 years! I’ve even been tracking the yardage numbers, mostly–I do have a few pieces that I think I forgot to add. (I was doing pretty well with seeing the numbers go down, at least until I got engaged and decided to be insane and make my own wedding dress and a bunch of curtains!) As far as this year goes, I am taking part in the Stashbusting Challenge from Cation Designs, though I’m unable to be an active participant in the challenges right now. And I did already have to break my no-buying-fabric pledge, but those were extenuating circumstances. So there’s my stash! 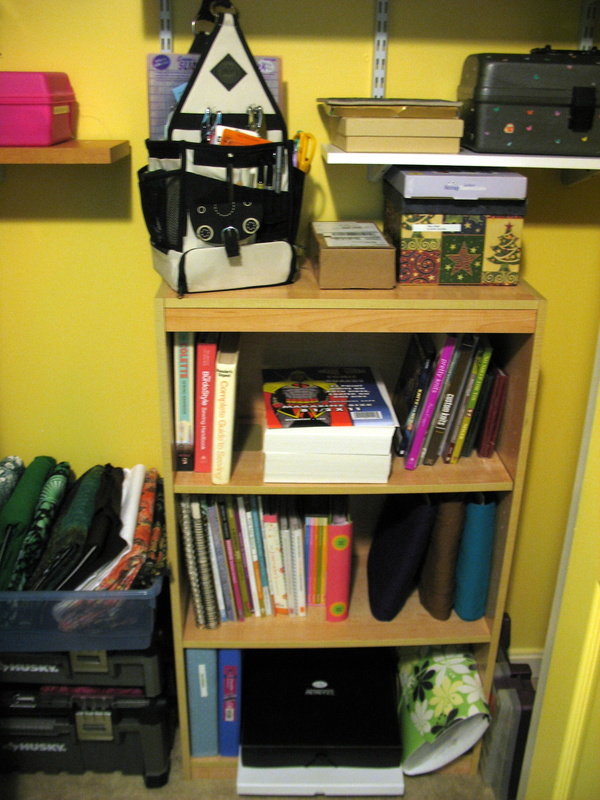 And a look in the new craft room closet, at least. Yes, the inside of the closet is painted–the room itself is turquoise. I hope you enjoyed taking a look–and I am definitely open to suggestions for how to use those fabrics that I showed! I can’t quite say yet that it’s almost a finished dress, since I haven’t cut out the lining yet. But it’s no longer a 2-piece ensemble, at least! Since my last post that directly related to the wedding dress, I’ve gotten quite a bit done. All of the skirt seams have been sewn, graded, pressed and catch-stitched to the underlining, except for the center back seam. The skirt and bodice are now attached to each other, as well! I ended up having to do a little sizing tweaking, because I’ve got the seam allowances from both the bodice and skirt finished towards the waistband, and that added a little bulk around my waist. In hindsight, perhaps I should have pressed the bodice edges up rather than down–I still think finishing the skirt towards the waistband will be better for supporting the weight of it–but what’s done is done, and I tried to grade things so that there’s as little added bulk as possible so I can’t go back and undo that part and change that. Even so, this waistband is now holding seam edges from 5 layers of bodice (lace, dupioni, crepe de chine and 2 layers of organza), plus 2 layers of skirt (dupioni & crepe de chine, though there’s also the actual seam allowances in there which doubles that). So I think I can be forgiven for needing to add a little extra in the back. Especially since I’ve been mostly consistent with at least getting in one workout a week since Christmas, and given my general lack of athleticism, that’s actually really good for my track record! Of course, this meant that I also needed to do some hand-attaching of the waistband in the back, since I hadn’t quite sewn far enough to factor in that possibility. 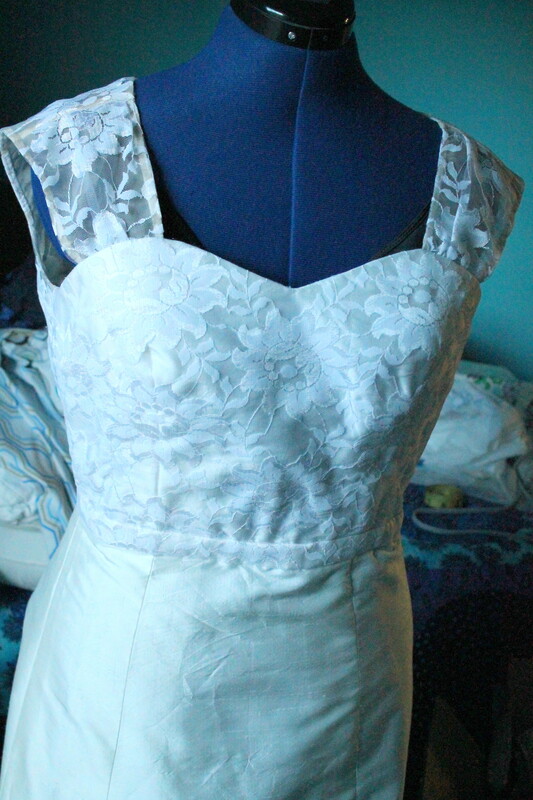 And I did need to add a patch of lace on one side, because I’d just barely had enough to cover on that side. Oops. That’s the other thing I’ve been doing, finishing those edges, again minus the center back. 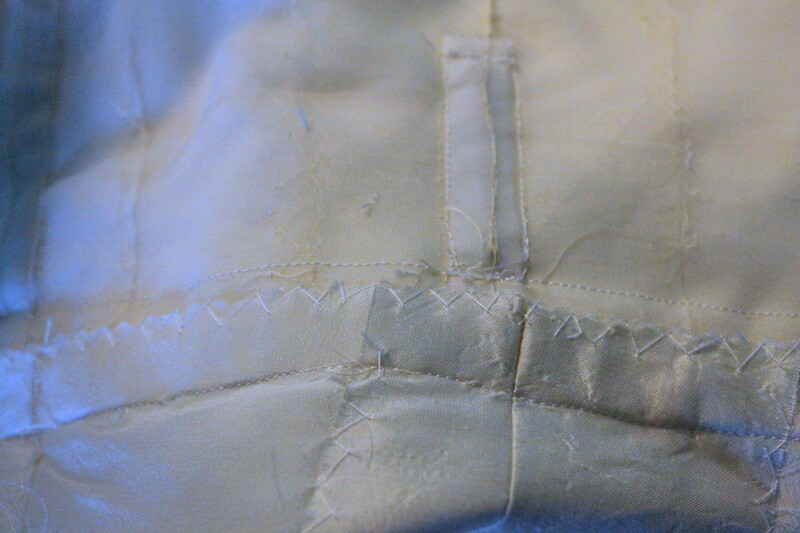 I went with the majority vote from my poll and did the hairline seam finish, with a hand-stitched last seam. Brooke suggested wash/steam-away thread as well, so I did do that. I’m not sure it entirely disappeared after the pressing/steaming, since it was entrapped in those layers and I couldn’t set the iron temperature very high for fear of scorching the lace, but it still looks better than I think the silk thread would have. The center back seam is partially sewn closed now, and I’m currently working on figuring out the lapped zipper. I do have some wide seam allowances to work with, and a good-looking tutorial on my sewing pinboard, so hopefully that will help me out. (Yeah, remember that Check The Technique thing I’ve been doing? Lapped zippers are on that list of things I’m not entirely comfortable doing, particularly since I’ve probably attempted this particular type of zipper the least. Unless you count separating zippers. Come to think of it, I’ll need to update that post for underlining after I finish this thing!) I do know that the trickiest part of this particular lapped zipper will be dealing with the sheer edges that start right above it, without making them look uneven. But I do plan on hand-picking this zipper, so that means I can take it nice and slow and hopefully do it right. That won’t finish the outside. I need to add buttons, particularly at the top of the sheer part where I do need a functional closure. I’ll need to hem it. And I still want to put those lace sunflower appliques somewhere around the lower circumference of the skirt. But, minus that last part, it’s looking like I may be able to at least finish the outside of this dress before I go back to work. Here’s hoping! First of all: I don’t believe that emerald green is really the color of the year. Either that, or no one listens to Pantone. Because if they did, people would actually be selling emerald green fabric, don’t you think? So, my fiance requested very early in the planning process that I make him a tie. I say this in the most loving way possible–he’s not exactly what I could call a “stylish” man. The Anthony Lilore quote that Cidell posted recently–that is a very accurate description of his style. So given this (and the fact that he’s flat-out told me that I probably shouldn’t ever attempt sewing clothes for him, because he probably won’t wear them), I felt like I should honor his request. My original plan was to make a sash for my dress and a tie for him out of the same fabric. The problem has been actually finding some fabric, because it is really hard to find nice fabric that is solid green and not either chartreuse or olive, neither of which would really work for a June wedding with sunflowers. (If this was a fall wedding, I might be all over the olive, but it’s not.) 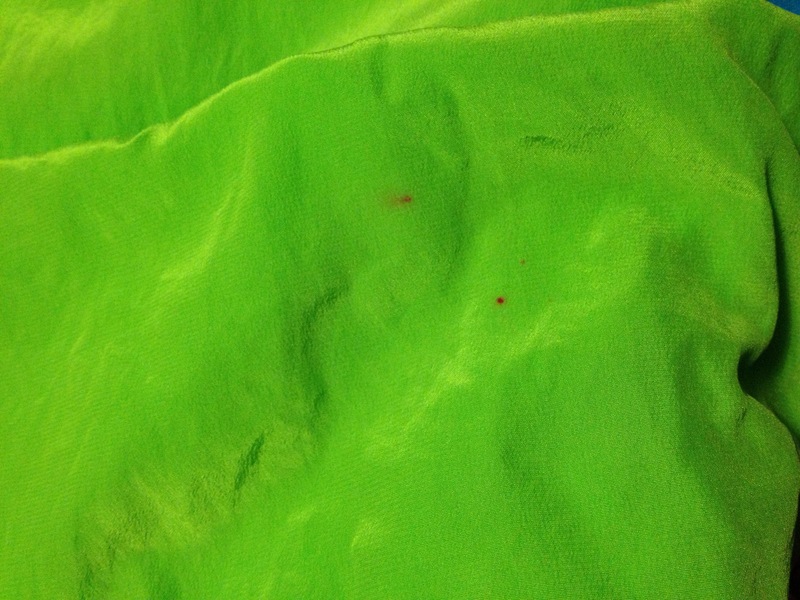 I finally found a piece of lightweight silk at Gorgeous Fabrics that was lableled “happy green”, and looked to be kind of a bluer shade of yellow-green. And this is where the dangers of fabric shopping on the internet comes into play, because I got it in and it was basically lime. I like lime green. I think it’s a very happy color. But it was also most definitely brighter than I wanted for the wedding, mostly because of trying to match accessories for me and the bridesmaids to that. So I ordered some kelly green dye from Dharma Trading Co. and decided to see what I could do. I figured that doing the washing machine route would be the best for an even color job. And Doug has a top-loader machine, which is what is usually recommended for this. So since we were having a low-key hangout at his place for his birthday on Saturday anyway, he was fine with me experimenting. So I got the fabric wet, put the dye in, and let it run through the cycle. Yeah, it basically looks exactly the same as it did before, doesn’t it? With the annoying addition of a few red dots right in the middle of the fabric, and a loss of the nice silky feel that it had before. *facepalm*I did try washing it again on Monday–with fabric softener–but it doesn’t seem to have helped yet. I’m going to run it through again soon, since I got some things at Goodwill that I need to wash anyway. So after I freaked out a little and he got me calmed down, we headed over to Michaels’ to see if we could get some other dye. The selection of greens was rather limited, but we got some dark green since it looked like it would turn out decent. At his suggestion, I just cut a narrow strip off of the bottom and did a test run first. It’s a good thing, because it basically turned out to be army green. (I don’t have a picture of this, and already threw the strip away, so you’ll just have to trust me on this one.) At least now I know the washer dyes. So I gave up for the day and cleaned out the machine. At this point, and after looking on Dharma again, I gave up and ordered a new piece of fabric from Mood on Sunday morning. It’s polyester, and I feel bad because I’m indulging myself with a silk dress and wanted to make him something nice too. But the powers-that-be are not working with me on the colors, you know? This also means that I’ve already broken my stashbusting pledge to not buy new fabric, but I think I can chalk this one up to special circumstances. I only bought a yard because at this point, the sash seems like more trouble than it’s worth. And at least with kelly green, I do have a better chance of finding jewelry to match. Assuming I can get it, because I also got a call last night saying that they don’t have it and wanted to talk to me about what my options are! I tried calling them back and it hung up both times–the original call had been during one of my lessons and I couldn’t pick up. So I guess I’ll call them today and see what’s up. 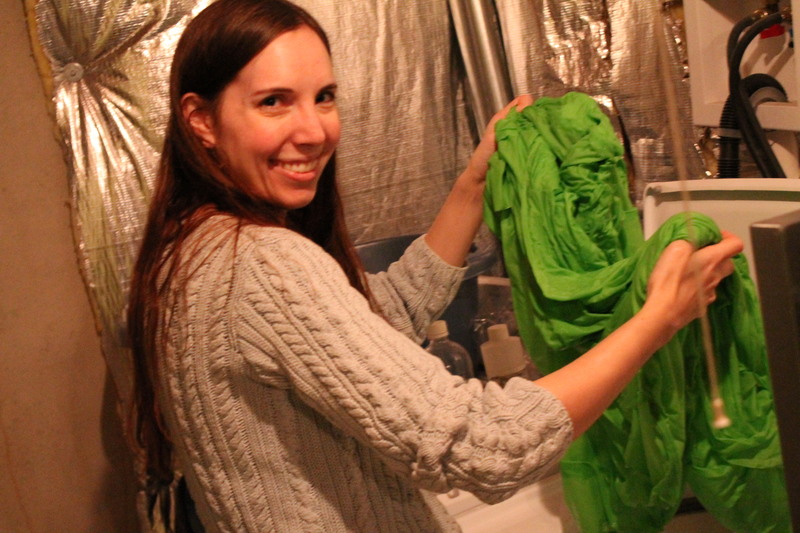 Seriously, people–why is it so hard to find solid green fabric?! The really annoying thing is that I need this fabric asap, so I can match the color to other things I need to get sorted really soon. Like centerpieces and cake. 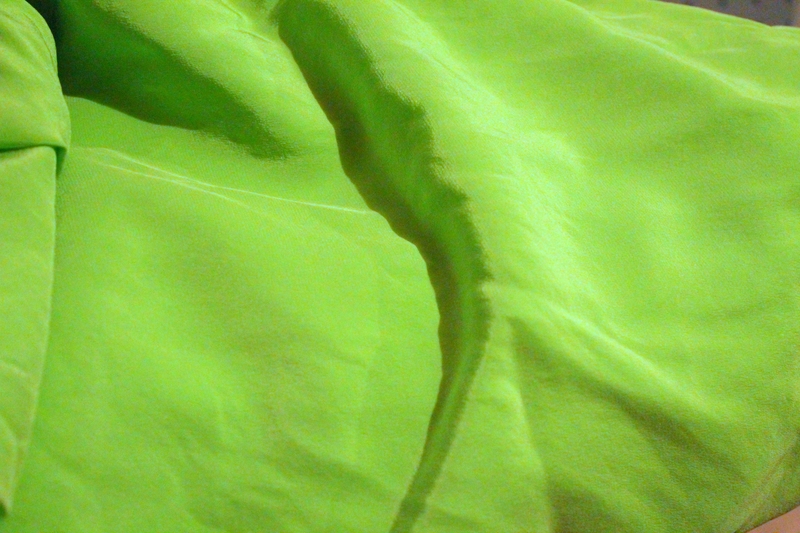 This also means that I have about 3 yards of lime green silk with not much to do with it. Doug said multiple times that he likes the color. So I may try my hand at some lingerie. And maybe the Alma blouse, since I do have some skirts that a lime green top would look great with. If I can get this nice drape and hand back. Stupid dye. Edit, 12:43 pm: I got back in touch with Mood, and was told that they wouldn’t get it in for 4-6 weeks! Which is kind of pushing it for a lot of the other things I need to match the color to. But the woman on the phone was very helpful, and I was able to swap it out for another piece that was the same price. And–get this–emerald. So hopefully that will be the end of the drama! Such a hard decision, so many of Tasia’s designs are lovely. I would go with Thurlow, it would nice to try out a pant drafted for a small waist to large hip ratio. That’s exactly the reason I’m excited to try the Thurlow as soon as I get a chance to! Congrats, Helena, and I’ll be contacting you for your address information so I can get your new pattern on the way to you! I’ve gotten absolutely nothing accomplished on the dress this morning, because I’m too busy baking. My fiance’s birthday is tomorrow, and I’ve got a little get-together with some girlfriends tonight. Ironically, this was postponed from two weeks ago due to bad winter weather, and now we have a nor’easter rolling through! But it looks like my area is going to get nothing but rain until 9 or later. As much as I hate winter rain because it is the most depressing weather EVER, I’m glad the snow is going to hold off long enough for me to hang out with my friends! And I doubt we’ll be staying super-late, since the friend’s house we’re meeting at is my bridesmaid who had the baby 2 months ago today. My hands have been busy, and so has my brain, trying to wrap it around all of the things I need to get done in the next 4 months. And several of them have a DIY component, so that justifies me doing a brain dump here, right? The dress, obviously. I am 4 catch-stitched seam allowances away from being ready to sew the skirt onto the bodice, woohoo! Which I’m hoping I can get done today, because between Doug’s birthday, church activities and flute choir, it looks like this weekend is going to be a total bust for sewing. Jewelry for the bridesmaids, which I may or may not have to end up making myself. It’s dependent on whatever color this fabric ends up being (ohpleaseohpleaseohpleaseworkout) and whatever dresses my girls end up getting. I don’t particularly care if they wear the same dress, we’re just doing knee-length black something or other so I can up the chances that this dress can actually be worn again, but I do need to have an idea about necklines so I can see if necklaces are in or out, you know? Centerpieces for the reception. We were originally planning to incorporate my mom’s teapot collection, but we didn’t have nearly enough that would work and it was way too expensive to get enough. So we’re painting some flowerpots instead and filling them with the artificial flowers. 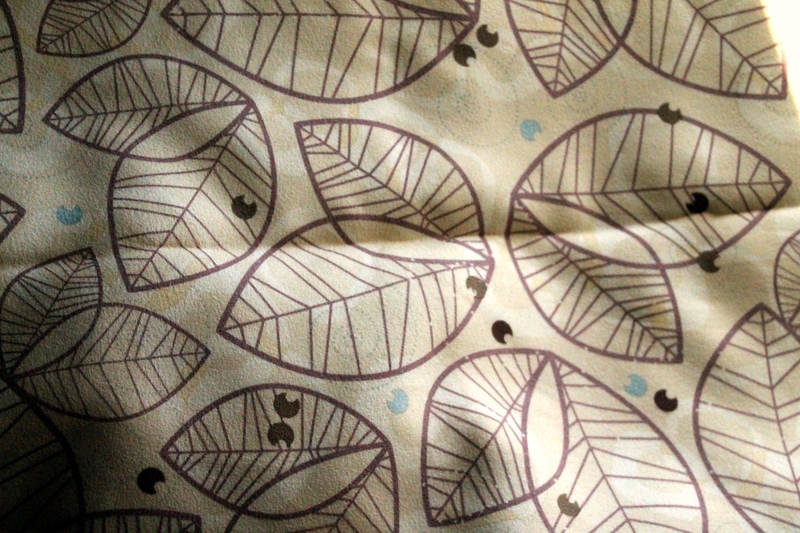 This is also going to depend on what color green this fabric ends up being. On the plus side, I may be able to reuse some of these pots afterwards to grow some herbs or something. But it’s still another DIY. I also need to finish figuring out flowers for the ceremony, but my church got renovated and no one seems to know what the deal is for weddings now that the sanctuary looks very different and so I’m kind of stuck. I need to get back in touch with the baker to confirm coloring for some details on the cake. Again, waiting on that green fabric. Invitations, thankfully, are done and printed. Hopefully having invitations that don’t completely fill the envelope won’t look tacky, because we had to get larger envelopes to accommodate RSVP cards due to the sizing. I just need to get stamps, stuff ’em and send ’em, but that can wait till next month. I’m making these paper sunflowers to go on the table numbers, which is in progress, but still quite a bit to do. I need to get a garment bag for the dress. And that is just all I’m able to think of off the top of my head that is related to things I’m making, and doesn’t even factor in things like moving. Do I sound stressed? I’m sorry to say that I’m beginning to feel stressed! a mildly belated (or perhaps very early) giveaway! 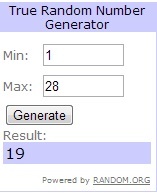 2/12/13 update: This giveaway is now CLOSED. I’ll draw and announce the winner later this week. It’s Sew Grateful week! I didn’t join in the fun last year, but since I’m having to sit out of all the sewalongs and such right now, I’m excited that this is something in the sewing community that I can be a part of! It’s also my birthday later this month, so I wanted to do a giveaway sometime this month anyway. So let’s just do this for both, shall we? Since I’ve been spending sooooo much time with the Cambie dress over the last several months, that was the first thing that popped into my head. 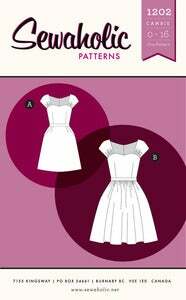 So for this giveaway, it’s going to be your choice of pattern from Sewaholic Patterns! So you could make your very own Cambie….maybe a little less time-consuming than mine! Or maybe you want to conquer your fear of knits? Everyone raves about the Renfrew, and for good reason. I love mine, and can’t wait to make another several! Maybe you’re like me and am desperately in need of pants and shorts. 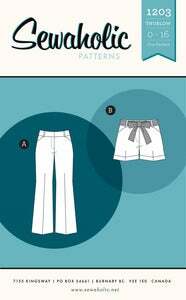 I haven’t tried these myself yet, but I’m super-excited to make the Thurlow Trousers, and I’ve seen a lot of great reviews of this pattern around the sewing blogs, too. Or maybe you’re just learning to sew and you want something simple. 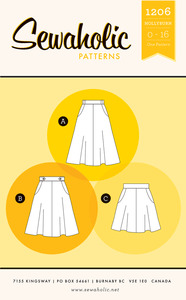 In that case, maybe you want her latest pattern, the Hollyburn Skirt! It’s based off her Lonsdale Dress, which I made a modified version of last summer, so I know it’s a great pattern! And of course this isn’t all of them–she has patterns for jackets, skirts and other dresses up on her site, too, so be sure to check it out! I’m going to leave this open a little longer than probably most of the Sew Grateful giveaways, since I’m a little late posting it up to begin with. Not quite all the way to my birthday, since that’s at the end of the month, but the deadline will be 12 noon, Eastern Standard Time, on February 12. To enter, just leave a comment saying which pattern you’d get. I’ll have Tasia ship the pattern directly to you, so this one’s open to anywhere! 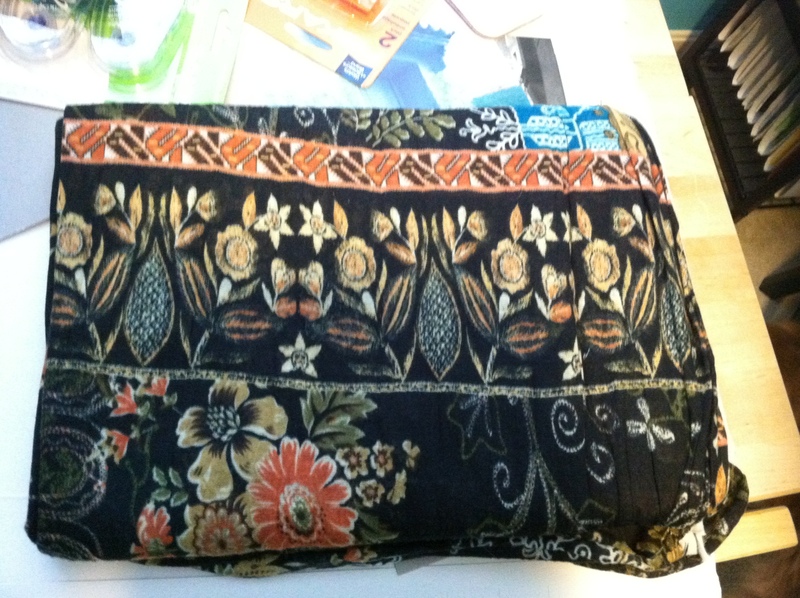 And while you’re at it, check out the Swap My Stash that Kat and Anne are hosting! I’ve already had 3 of my pieces claimed, so I’m excited about that. It’s a great way to get some less-loved things out of your stash and get some new pretty things in return! I’m focusing more on fabric, since I already did a pretty serious pattern purge within the last year or so, but there’s also patterns and some notions up for grabs. You can see everything on the Pinterest board— just make sure to check the comments because some things up there have been claimed already. As you know, I need to go through all of my belongings in preparation for moving, and it’s time that I unload some stash. My original plan was to just do a take-what-you-want giveaway on here, but then Modern Vintage Cupcakes decided to do a bigger swap, so I’m jumping in on that instead! It looks really fun, so if you want to join in, be sure to check it out! Without further ado, here’s what’s up for grabs! 2. 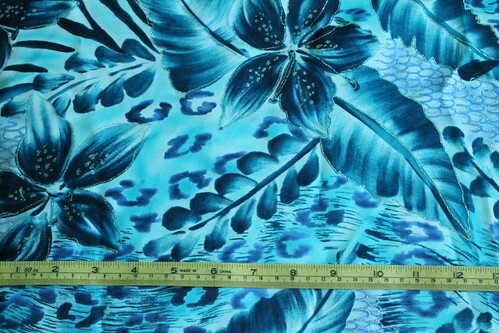 A silky polyester print, 1 1/2 yards, 58″ wide (1.3716 x 1.4732 m). There’s a swatch-sized piece cut out of the corner. I bought this to line some red twill with thoughts of making the Beignet skirt, but I’ve since thrifted a red dress that is great for layering and now I’m probably going to make some kind of shorts or capris out of that twill instead, making this unnecessary, since red isn’t a color I wear often. I know it’s busy, but it could be a fun lining. 3. A light green lining, probably polyester. 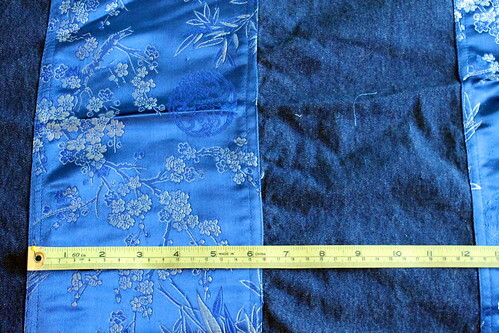 1 yard plus two ends by the selvedge with a chunk cut out of the middle, 48″ wide (approx. .9144 x 1.2192 m). I’m not sure why I have this, because I don’t really do pastels. I was having trouble getting the coloring right on this photo–it’s a little less mint, a little more yellowy. Maybe a celery green or something? 5. 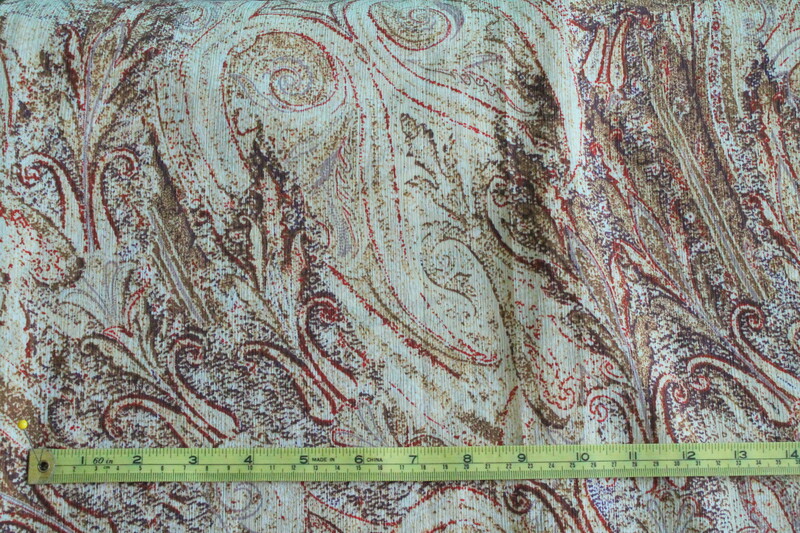 A crinkle-textured polyester print, 2 1/2 yards, 44″ wide (2.286 x 1.1176m). There’s a swatch-sized piece cut out of the corner. I’ve had this one sitting around since sometime during my college years, never made the project I bought it for, and it’s definitely in the use-or-lose stage of its life. So I’ll see what I can come up with if no one wants it, but I figured I’d see if someone else might want it first. It’s hard to see the colors in this one, so it’s kind of an impressionistic paisley with dots of red, purple and a few shades of brown. 6. 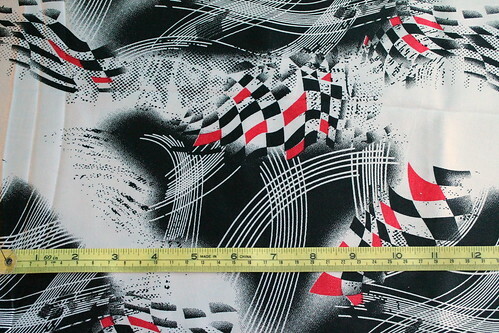 A striped polyester silky print, 1 yard, 44″ wide (.9144 x 1.1176 m). There’s a swatch-sized piece cut out. The stripes run perpendicular to the selvedge. 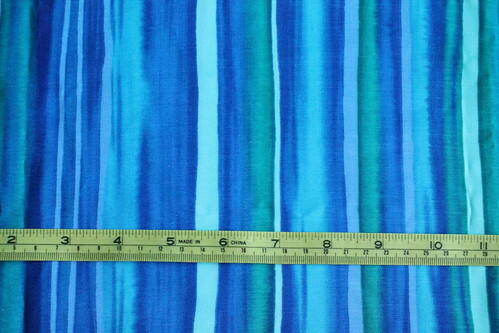 I bought this, along with several other fabrics, to make a patchwork-ish striped skirt that I’d seen in Threads magazine. I never got around to it, lost interest, and a few of those fabrics have since gotten used for other things. 8.Reserved for Juliet! 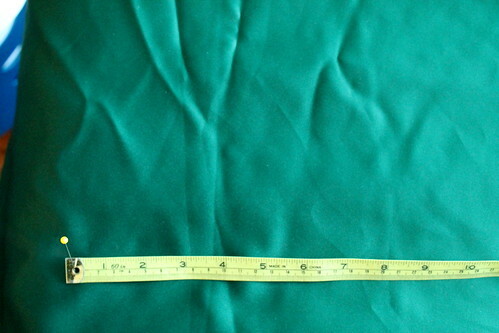 A floral polyester shantung. 1 2/3 yard plus some good-sized scraps, 58″ wide (1.524 x 1.4732m). This is the leftovers from this dress— I’d originally planned to make this into a maxi-dress, but decided it just wouldn’t work with the drape of the fabric. The “good-sized scraps” are the bottom parts of those skirt pieces, since I cut it out as the maxi first, and then thought better of it and chopped it off to the shorter length before sewing. But they’re still large enough that you might be able to squeeze some smaller pattern pieces out of them. I still think this fabric is gorgeous, but I just can’t think of anything to do with it other than a second dress, and I don’t need two dresses of the same print, you know? 9. 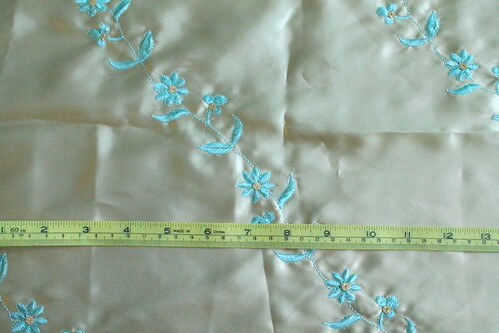 An embroidered gold lightweight satin, polyester, 1 1/3 yard, 46″ wide (1.219 x 1.1684 m). The embroidery is done more or less on the bias, and does not reach all the way to the edges (about 2.5″ away on one side and 2″ away on the other). There is one minor flaw–when I was photographing this, I found a somewhat larger-than-pinhole-sized hole right next to one of the embroidered flowers. It felt like the edges had been sealed during manufacturing, so I don’t think it will get bigger, but you may need to watch pattern placement if that’s an issue. This one is leftover from aaaaaall the way back to the early days of this blog, after making this dress. And again, I haven’t figured out what to do with the rest of it yet. 10. 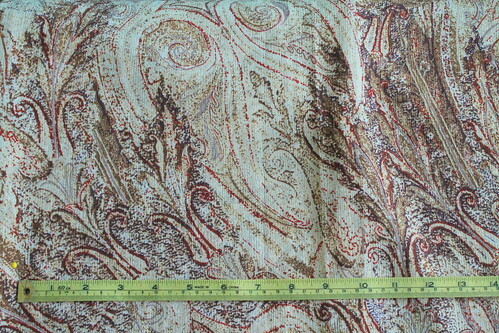 A floral polyester brocade, 2 yards, 46″ wide (1.8288 x 1.1684m). There’s a swatch-sized piece cut out. I think this one was also given to me by my mom’s stashbusting once she decided that it was going to be all quilts all the time for her. 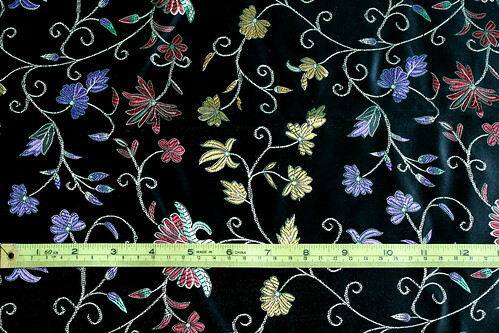 And this is one of two floral-on-black brocades that I have and still haven’t figured out what to do with, so I thought I’d see if someone else can have fun with this one. 11. 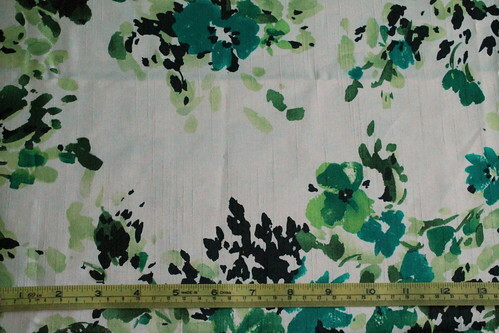 A hunter green satin, just shy of 1 1/2 yards, 58″ wide (approx. 1.3716 x 1.4732 m), plus a big diagonal piece on one side. For those of you in the States who are familiar with Joann Fabrics, this is their Casa Satin. 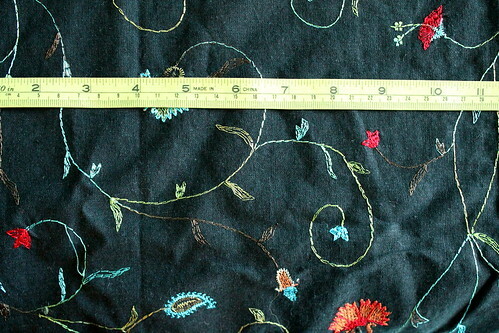 I’ve actually used this fabric twice now–for my masters’ degree recital dress, and also for my Licorice dress–and still had this much left over. I must have done a terrible job of estimating fabric usage for that first dress! 12. Reserved for Kat! 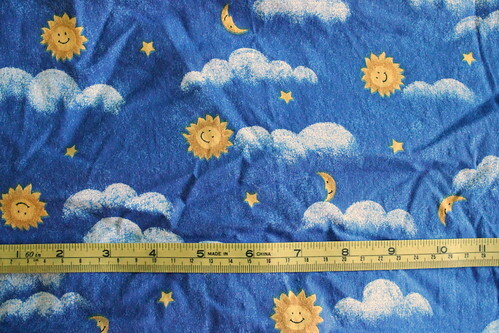 A quilting-weight cotton or cotton blend, about 3 yards, 44″ wide (2.7432 x 1.1176 m), plus an extra rectangle on one end. This one was given to me by a friend who was destashing some craft supplies, so I’m not entirely sure of the fiber content. I used it to line a couple of baby bibs, but that’s it. This would be cute for kid stuff, but since I have no kids (and very few young kids in my life, period) I really have no use for this. 13. 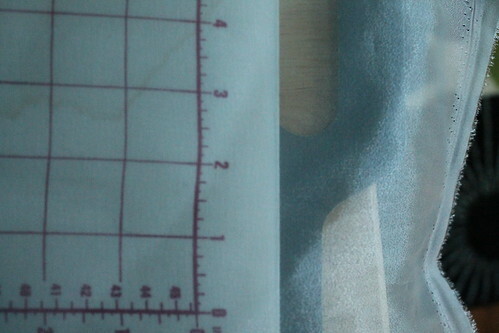 An embroidered linen (or linen-looking) fabric, about .85 yard, 52″ wide (.777 x 1.3208m), The embroidery starts 1.5″-3.75″ from the selvedge, depending on where in the pattern it is. The embroidery is in shades of olive green, brown, turquoise, red and orange. 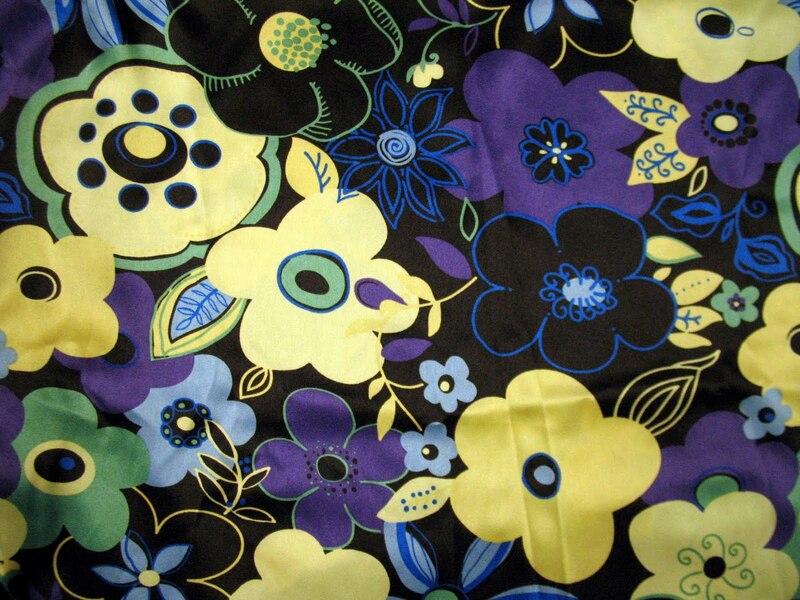 This one was used to make my “Cha-cha” skirt. And it’s super-cute, but I’m not sure what to do with the rest of it unless it’s a bag, and a girl only needs so many bags. 14. 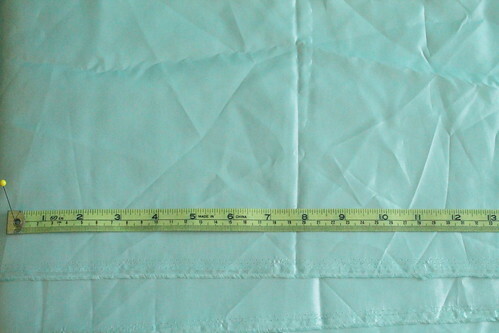 Polyester beige organza, 1.3 yd, 62″ wide (1.889 x 1.575m), plus a little ireegular bit on the end. This one was very hard to photograph, but it’s just a neutral beige with a shimmer effect on it. (Slightly darker than pale woman of Anglo-Celtic-German decent, if that helps?) This one was for my muslin of my wedding dress, of course, and I seriously overestimated how much I needed. 15. Reserved for Imogheena! 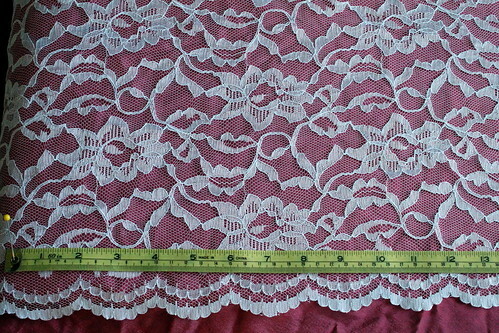 White allover lace, 1.8 yd, 64″ wide, including the wider part of the scallops. 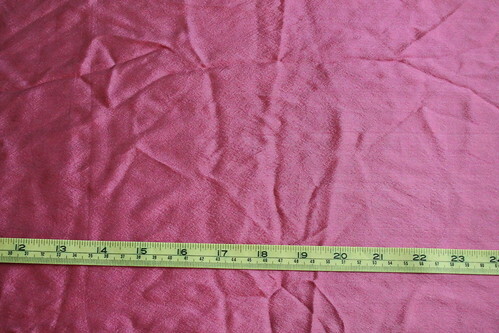 (About 1.646 x 1.626 m.) I photographed this one on top of the pink silk so the pattern could be seen better. The scallops are about 2″ wide, and are on both sides. This was also for the wedding dress muslin. And again, I seriously overestimated. I don’t really do lace in my day-to-day life, you know? So that’s it! 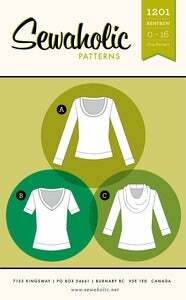 Like I said, if you’re interested in joining in and swapping out some of your less-loved fabric for something new, be sure to check out the rules/guidelines. And if you’re interested in taking some of this off of my hands, let me know! Happy February, everyone! First of all, thanks to everyone who has taken the time to vote on my little poll in the last post! There’s been 19 answers so far, with the hairline seam taking the clear lead. Brooke suggested some nifty thread that vanishes with an iron steaming, so I think I’m going to get some of that and run with it. I probably need another spool of white anyway, considering that I’ll have to start busting into that for basting and such. I’ve been using my one spool of ecru for that and the inside seam finishing, in order to save the white for where it shows, and reached the point where I’m about half a skirt’s basting away from running out. In other exciting dress news, I’m at the point where I can start basting the skirt together! The waistband is on the bodice as of yesterday, and the seam between them is all stitched down nicely. Out of necessity, I’m waiting to do the center back edge finishing (and therefore the neckline’s too) until I get the zipper in. The last time I checked it, the placement of the side seams were great but there was too much room at the upper back of the dupioni part, so I’d like to have the skirt on so I can check the fit all at once. 1. I have basically no internal temperature regulation this time of year, no matter how unseasonably warm it gets. For example; on Wednesday, it got up to 66 degrees. Practically balmy, right? While I did manage to brave 3/4 sleeves, I ended up keeping my favorite bulky brown hoodie cardigan on all day, too. And I was STILL cold enough to drink several mugs’ worth of tea. 3. If the Polyvore-type sets that abound on Pinterest, such as the one above, are any indication, winter clothes are just boooooring. Everything is solid and neutral, mostly grey, black and taupe. I can appreciate a good piece in the first two colors, but isn’t winter in the northern hemisphere dull and neutral enough? Where’s the color? Where are the prints? Incidentally, I’m pretty bored with everything in my closet too, and kind of resent that it’ll be at least another 2 months before I can consider diving back into my shorter-sleeved things without potentially freezing. 5. I don’t necessarily have things to go with those jackets, and my fabric stash also has a VERY heavy bias towards fashion for the warmer months. Remember this jacket? Or this one? I still like them both, and so I’m not going to purge them from my closet, but I’ve hardly worn either because I just don’t really have much to go with them. Topwise, it’s not so much of an issue with the BurdaStyle book jacket because it doesn’t look right if I leave it open at the front, but as I’ve complained on here multiple times, I am in dire need of pants that fit well and aren’t too short or worn out. Thus the desire for that Thurlow-fest I keep saying that I’m going to do after the dress. 1. Evaluate my winter wardrobe/dressing habits. This isn’t too hard, because I know that once the temperatures drop below 45F, I never, ever want to wear skirts or dresses, because there are no tights in the world that can keep my legs warm. Making those pants will help a lot, so at least that’s the one thing I can do this year and still keep to my stashbusting pledge. 2. Improve my knitting. Because so often, I just want to wear sweaters. And Goodwill’s been letting me down lately. 5. Color, color, color. I need it this time of year.